A grand astronomical phenomenon was seen in Tokyo, the morning of May 21, 2012; the moon covered most part of the sun leaving the glittering ring on its outermost edge. 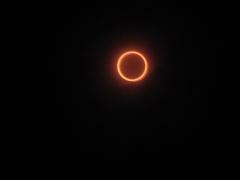 The phenomenon triggered by the sun and the moon is significant event for Cardcaptors fans! :-P Well, the phenomenon—so-called the annular solar eclipse—occurs when the earth, the moon, and the sun align in a straight line (see the figure below); which is similar to a total solar eclipse. But it's slightly different, concerned with the distance to the moon. An annular solar eclipse occurs when the moon is too distant to cause a total eclipe, because the moon is seen smaller than the sun; thereby the moon cannot cover entirely the sun, consequently leaving the sun's outermost edge is left uncovered. Figure: Illustration of the principle how an annular eclipse occurs. Even when the alignment of the three of the astromical bodies satisfies the condition like the Figure above, the annular solar eclipse can be observed in a small area on the earth. See the Figure above. The small area on the earth on which the thick gray shadow is projected is the area where you can see the annular solar eclipse, while the area of the light gray shadow is the area you can see the partial solar eclipse. Such a lucky area of thick gray shadow that was set up on May 21, includes Tokyo. 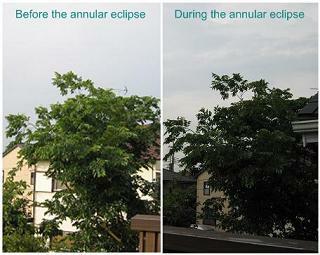 Shown in the pictures below was the annular solar eclipse that was observed in Tokyo in the morning of May 21, 2012. Yes, that's what really happened. It's not that Eli did with his magic in order to test Sakura. Starting to be eclipsed around 6:30 a.m., the sun was gradually getting thinner until about an hour later it was hidden behind the moon leaving its outermost edge. 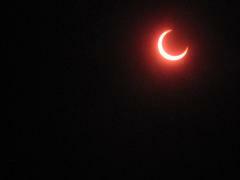 You might think it would be pitch dark during the annular solar eclipse just like a total solar eclipse. 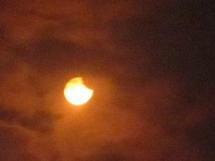 Even though most of its part was eclipsed, the sun was still bright. Nevertheless, the sky was darken as shown in the comperison of the pictures on your left hand side. See? 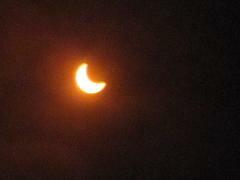 During the annular solar eclipse, it was less bright than usual, but it's bright enough to see everthing around. Anyway, an annular solar eclipse is such a rare phenomenon that the last one observed in Tokyo was 173 years ago, and the next one will come 300 years later.